It can reflect the unique style of the designer. Traditional bending methods such as forced bending, free bending and even three-point bending have been unable to meet the above requirements. 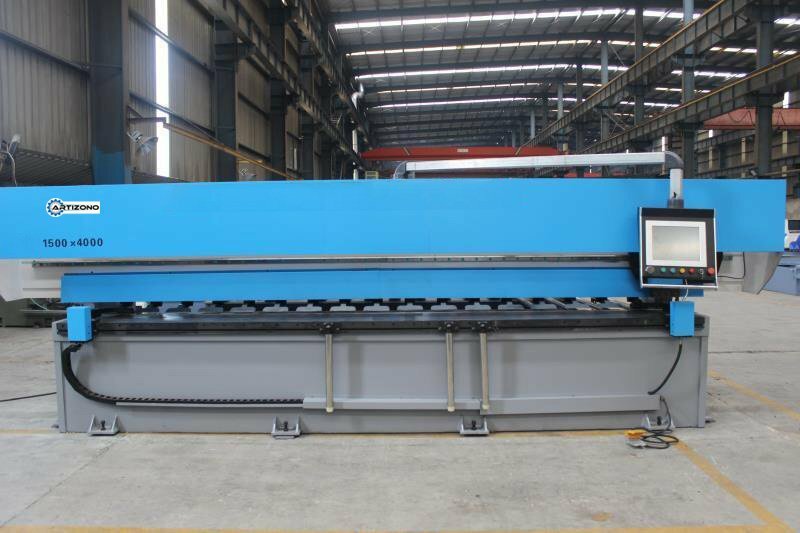 In other words, bending the metal sheet with press brake alone can not meet the design requirements of the designer, and can not reach the grade and decorative effect of middle and high-grade decoration. The following workpiece is not able to be finished just with press brake machine. Therefore, a novel bending technique is developed, which is: V-groove bending technology. 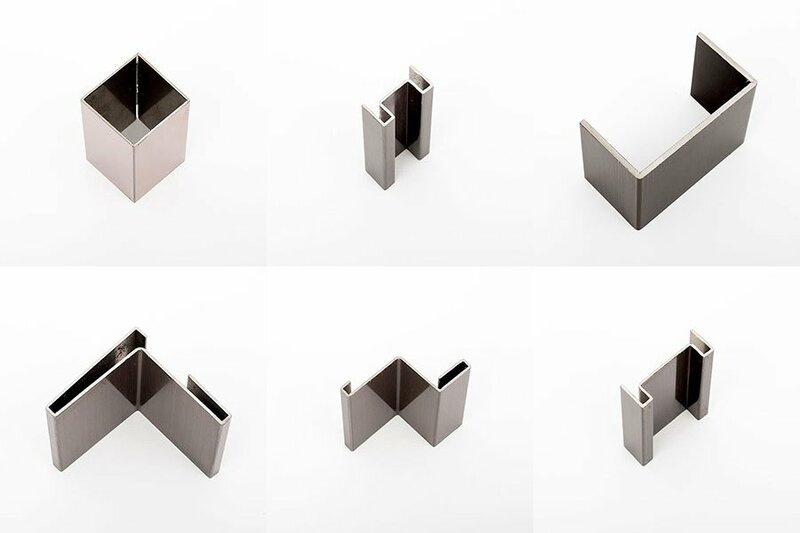 What is the fabrication process of V-groove bend forming? 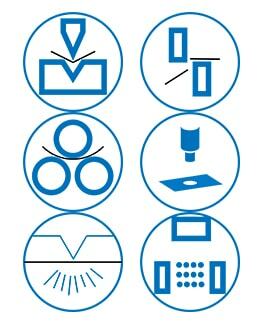 Adopt V-grooving (or V cut) method on the metal sheet first, then bend the grooved sheet metal into various angles and shapes by press brake with general mold or special mold. Such a curved workpiece can meet the special needs of high-end decoration in hotels, restaurants, restaurants, shopping malls, bank and airports. 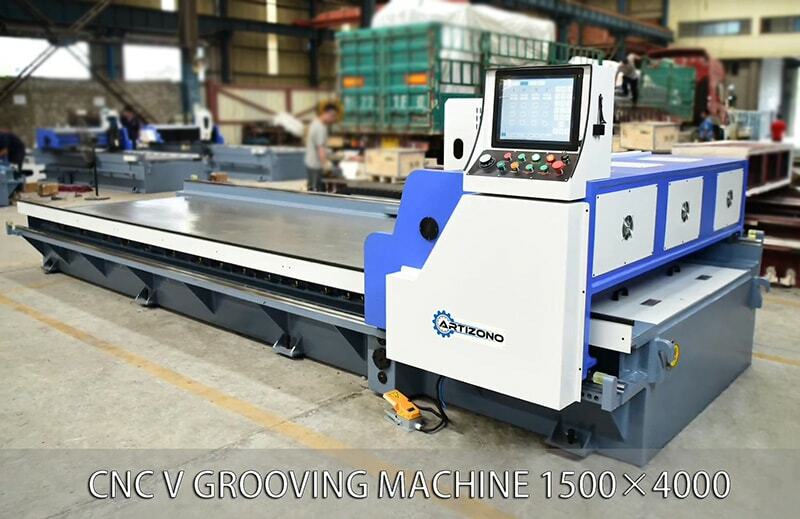 The main equipment of v-groove bending technology is press brake and sheet metal V-groover (also been called V-grooving machine). The press brake is a traditional plate bending machine, and the thin plate V-grooving machine is a new type of sheet metal processing machinery, which is the key equipment of V-cut bending technology. For better understand the press brake machine, you can refer to The Ultimate Guide to Press Brake. So, what is sheet metal V-grooving Machine? 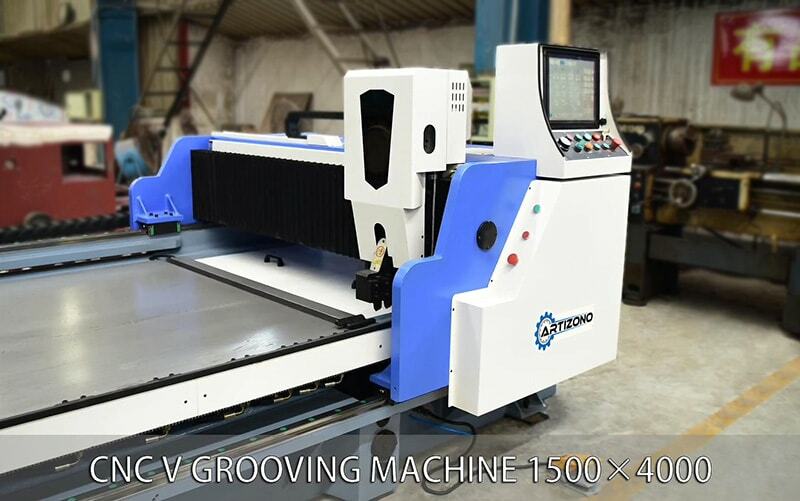 V-groover, also been called CNC V-Cutting Machine, V-grooving Machine. It’s mainly used to realize a certain depth V-cutting of stainless steel plate, ordinary steel plate, aluminum plate, copper plate, composite plate under 4mm before bend forming. The workpiece produced with such technique has small bending radius, not obvious color changes, small bending force requirements etc. Besides, it reduces the straightness error of the round edge of narrow long workpieces, and the common press brake and toolings can be used to bend the workpiece with complicated section shape. V-grooving machines are widely used in stainless steel decoration, elevator, security doors and cabinet industries. Due to the fact that the planer doesn’t have the effective metal sheet pressing device, the V-grooving depth of the metal sheet and the positioning distance of V groove cannot be precisely controlled. Besides, the planer has high energy consumption and low efficiency. The new type of metal sheet grooving machine is designed and manufactured according to the special needs of the middle and high-end decoration industry and elevator manufacturing industry. It can make V-shaped grooves for materials such as stainless steel sheet, iron plate and copper plate. If some specially dedicated accessories are installed, the metal sheet V-grooving machine can also be used for grinding, polishing and drawing of metal sheet materials and profiles. Currently, the length of the metal plate for V-grooving is: 2500mm, 3200mm, 4000mm, 5000mm, 6000mm and the processing width of sheet metal mainly is: 1250mm, 1500mm, 2200mm, 2400mm. 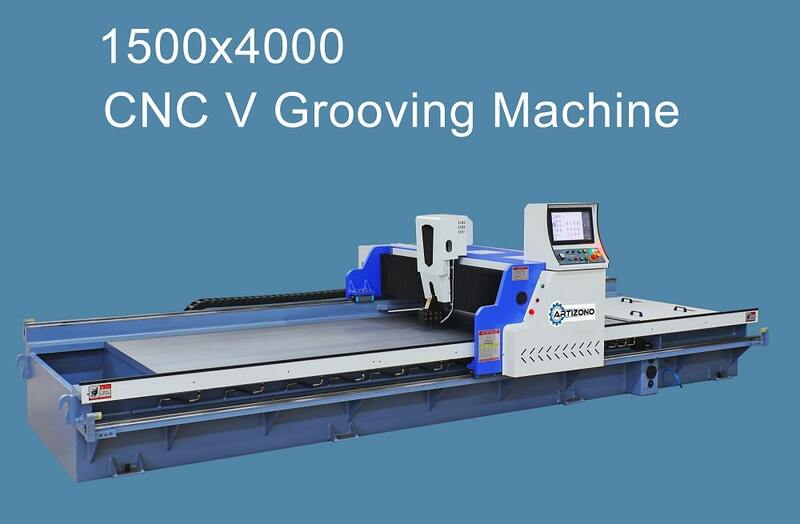 The most popular type is 4000×1250 (L*W) V grooving machine. The structure is fixed for the beam, and the tool holder can be positioned on the crossbeam before the groove. The processed sheet material is fixed on the worktable by pressing device, and the V-shaped groove is carried out with the worktable moves back and forth along the long rail. It’s similar to a dedicated planer. The energy consumption is very high during sheet metal V-grooving because the worktable, which is driven by the motor, is moving back and forth along the long rail. The worktable is fixed, and the processed sheet is fixed on the worktable by pressing device. The tool holder is positioned on the crossbeam by moving left and right. The V-grooving is realized by the beam moving back and forth along the long rail on the worktable. During V-grooving process, the worktable is fixed, but the energy consumption is very high due to the reciprocating motion of the beam along the long rail. The beam conducts the pre-grooving positioning by moving back and forth along the short rail of the worktable. The tool holder does the left and right reciprocating motion on the beam to conduct V cutting. The energy consumption is low due to the fixed worktable and beam during V-grooving while the power driving the tool holder do the reciprocating motion along the long rail is much less than the power driving the worktable and beam. Fixed beam and worktable, and the processed sheet is conducting pre-grooving positioning by the feeding device moving back and forth. During V-cutting, it only drives the tool holder do reciprocating motion along the long rail, and light-duty feeding device is adopted for pre-grooving positioning without the need to drive a multi-ton beam. Therefore, it has the lowest energy consumption and the most obvious energy saving effect. The display resolution is 0.01 mm, enough to meet the actual requirements. It can be seen from the bending force calculation formula that the bending force required for bending of the workpiece is proportional to the thickness of the plate. The bending force is large for bending thick plate, and the bending force is small for the thin workpiece. In the V-shaped groove bending technique, the thickness of the plate is reduced by V cutting in the bending position of the plate, and reduced the bending force that is needed. Since the depth of the V-shaped groove is 1/2 plate thickness, it can save half of the bending force. For free bending, the bending radius is proportional to the V-opening width of the die. The width of the die opening is generally 8 to 12 times the thickness of the plate. To obtain a smaller bending radius, you need to select a die with smaller V-opening width. The thicker the plate, the larger the V-opening width of the die, and the bigger the bending radius. On the contrary, the thinner the plate, and the smaller the V-opening width of the selected die, and the smaller the bending radius. The thickness of the plate is reduced at the bend position by V grooving, and the bending radius of the workpiece are naturally proportionally reduced. In the plate strength range, the thinner the remaining thickness, the smaller the bending radius of the workpiece. During the V-shape bending process of the plate, the inside of the workpiece’s bending radius is under compress force and generate compression deformation. The outside of the bending radius is under stretch force and generate elongation. The main factors that influence the color changes of the bent round edge of the workpiece are the elongation deformation caused by the lateral tensile strength. 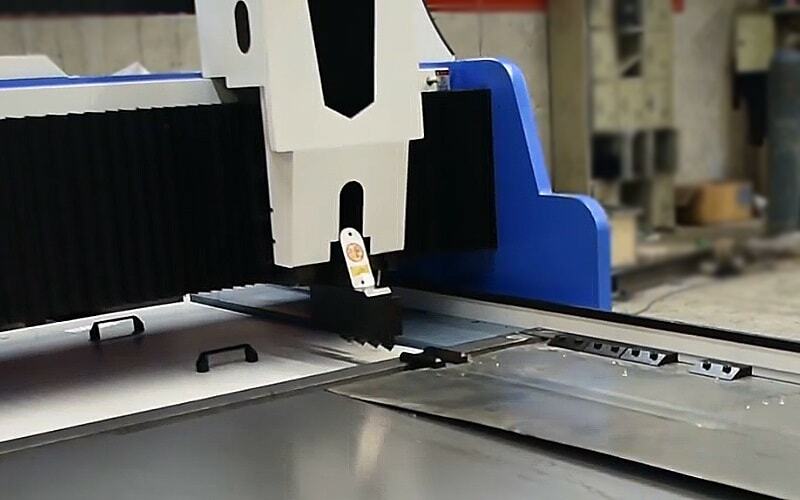 It can be seen from the V-shape bending process of the sheet that the elongation deformation caused by the lateral tensile force is also related to the thickness of the plate. By V-grooving the plate, the thickness of the plate at the bending position is reduced and the elongation deformation generated by the lateral tensile force during bending is also decreased, therefore realizing the purpose of small color changes at the bent round edges of the workpiece. Generally, in the process of bending narrow long workpiece, the inside of the bending radius generate compression deformation under compress force in the direction of width. The deformation materials move at both ends in length direction. The outside of the bending radius generates elongation under tensile strength in width direction. The materials move to the center in length direction. In this way, the bent around edge’s line of the workpiece forms center-concave. The larger the bending deformation, the more serious the center-concave of the edge line. The smaller the bending deformation, the less serious the center-concave of the edge line. Since V-grooving reduces the plate thickness at the bending position, the bending deformation also reduced, therefore, V-grooving bend forming technique makes the straightness errors of the edge line of the narrow long workpiece becomes small. 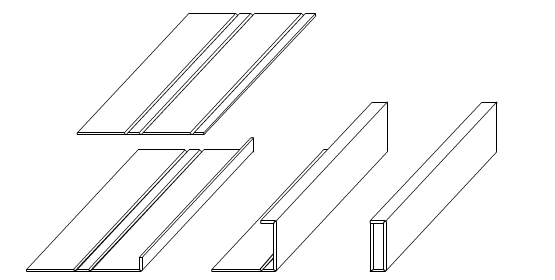 For press brake, just the general toolings are needed to conduct V-grooving bend forming technique. Some workpiece with complicated or enclosed cross-section can be bent without special toolings by correctly control the grooving depth and edge length (as shown in fig.2), which will reduce the expense incurred by the complex toolings with special design and shorten the processing cycle. 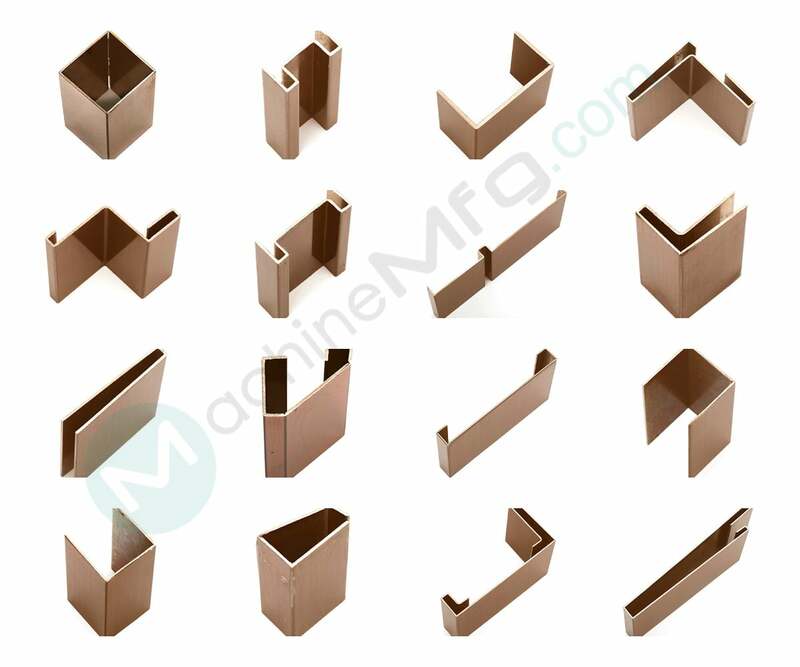 Due to the obvious advantages of V-shaped groove bending technology, and the traditional bending method and bending equipment are not changed, only the sheet metal V-grooving machine needs to be added, so V-grooving bend forming technology has been widely used in the emerging middle and high-grade decoration industry in the first place. It was then used in elevator manufacturing. Next, some experts in medical device manufacturing, electric control cabinet manufacturing industry also show their interest in V-grooving bend forming technology. It can be seen that with the deep understanding of the V-grooving bend forming technology, the application field of this technology will be broader. Open the air switch on the right side of the electricity box and then open the key switch on the front panel. The whole machine is electrified. The touch screen enters the initial screen after a delay of three seconds. The position of the beam relative to the initial point. This position is detected by the screw encoder, and the following numbers represent the number of the grooving line. Refers to the target position of the current moving beam. If the grooving machine still not start grooving when the beam moved at the right place, press the “beam movement” button, and the machine cannot move. Refers to the distance between the current groove and the previous groove. Refers to the 3D point of the current blade tip relative to the origin point, which is also the initial point. When this position is greater than 29.8mm, the tool holder will not move. The coordinate point is measured by the stepper motor encoder on the screw rod, and the number in the back indicates the number of grooving. 5). Plate width and plate thickness are set working parameters. 6). Press the start button to groove when the position light flashes. When the depth light flashes, press the “Move” button to run to the next position for grooving. 7). Press “manual operation” to control the operation screen by hand. 8). 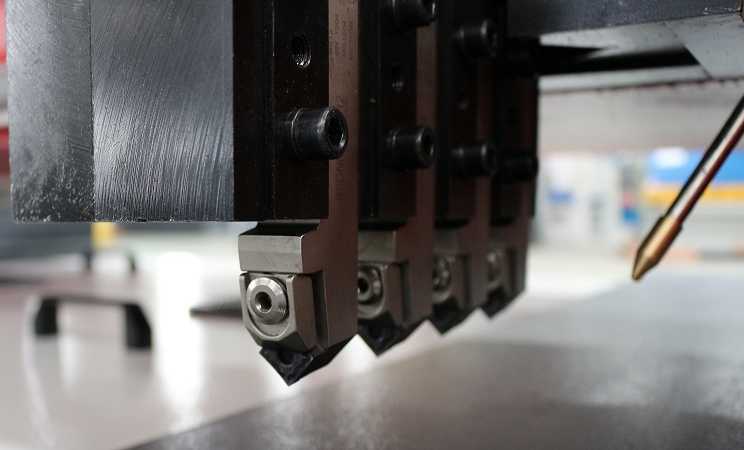 Press the “open groove preparation” button, the beam can be moved to the front of the platform, and the various grooved parameters are initialized to prepare for the grooving of the next metal plate. The beam will not move when the beam position is less than the initial position offset, but the parameter initialization is normal, and the button should not be pressed during the grooving. 9). In order to replace the blade, a grooving pause button is set. When the button is pressed, the grooving machine will stop working, and then press the button to restart the machine. 10). Press “parameter setting” to jump to the parameter setting screen. 1). “Beam forward” means that the beam moves forward in a manual manner and the moving speed is set in the system parameters. 2). “Beam backward” means to move the beam back in manual mode and set the moving speed in system parameters. 3). “Tool holder to the left” means to move the tool holder to the left in manual mode, and the movement speed is set in system parameters. 4). “Tool holder to the right” means to move the tool holder to the right in manual mode, and the moving speed is set in the system parameters. 5). “Tool holder up” means to move the tool holder up manually. 6). “Tool holder down” means to move the tool holder down manually. 7). “Operation instructions”: press this button to move the screen to the operation instruction screen. 8). “Origin alignment”: press this button to perform the function of returning the original to correct the position of the beam. In general, there is no need to perform the function of returning to the origin (because the computer does not have the function of location memory). However, if the grooving machine has stopped for more than two days, or if the position is not correctly caused by some other circumstances, the function of returning to the origin should be performed first after electrification to ensure the normal operation of the machine. 1). Press the “parameter setting” button to the parameter setting screen, where the grooving spacing can be set, and 50 grooves can be set totally. 2). The first groove can be set with a minimum value of 8mm and a maximum spacing of 1220mm. The rest grooves have no limits. 3). After pressing the menu you want to set, a digital keyboard appears on the screen。 “ENT” is the input confirmation button, “ES” means the input is canceled, “CR” means the input reset button. All the parameters are positive, if there is a negative number, the machine will report an error. 4). Press the “return” button to return the setting screen. 5). In the parameter setting, press the “system parameters” button to back to the system parameters screen. 6). After setting the parameters, check carefully according to the process sheet to prevent errors. 7). The #1 distance refers to the vertical distance from the 1st groove to the initial point. The #2 distance refers to the vertical distance from the 1st groove to the 2nd groove. And so on, for each of the groove distance. 8). In the parameter setting screen, the current process can be cleared by “parameter full clearance”. 1). “Deceleration advance” is the position of the beam positioning from high speed to a constant speed. This parameter is important for positioning. If each positioning exceeds the stroke, then increase this parameter, generally set to 8 mm, with a maximum setting of 9.999 mm. 2). “Positioning ahead” is the positioning position of the designated pre-stop. After the stop, the beam moves to the positioning position under the action of inertia. If the grooving machine doesn’t stop at the right position for each stop, it means the parameter setting is too large. Otherwise, the parameter setting is too small. The maximum data of this parameter can be set to 0.8mm. 3). “Allowable error” is the allowable error after the positioning. It is not allowed to groove if not in this range, and manual correction is required. 4). “Initial point error” refers to the distance between the blade tip and the edge after correcting the origin. The minimum setting is 8 mm. Otherwise, front-positioning proximity switch needs to be adjusted in time. When confirmed finished grooving, press “Moving Beam” button, the grooving machine will read out the position for next grooving and automatically add to the target position. The beam begins to move and positioning. After automatic positioning, a grooving process must be carried out before the beam can move again. It will keep going back and forth until finish all the grooving line. The grooved motor contactor is not pull in. 4). Press “Grooving ready” button to move the beam to the front of the platform. Lay the metal sheet flat on the workbench. If the metal sheet has a protective film, then the side with the protective film facing down. One side of the sheet metal clings to the benchmark block in front of the worktable. Press the sheet metal pressing button to tighten the edge of the sheet material and complete the positioning of the sheet material. Adjust the position of the proximity switch limit block at the left and right side of the tool holder slide block properly according to the length of the plate. Determine the spacing of the grooves and the forward and backward adjustment of the beam. Jog the “origin alignment” in the PLC touch screen to realize accurate positioning. That is, the beam displacement to the first groove position, press the follow-up press button to press the plate material tightly. The blade block with a thickness of 35mm is used to set the initial point of the blade, lock the pressing screw, and check the blade block to ensure the height of the blade. This is an important preparatory work to ensure the precise depth of the grooves and the production of safe grooves. Check whether the blade is in good condition and if the blade is badly worn, loosen the blade. Press the screw and rotate the blade 90 degrees, that is, change it to a new blade edge. Or flip the blade and change another blade surface. Press the work-in button on the operation panel of the electrical box to perform the first grooving. Generally, the first grooving depth is 0.3mm, followed by the thickness of the processed plate. After the groove depth meets the requirement, let the grooving blade exit the plate surface. The sliding frame automatically moves to the pre-set right limit position. The PLC controls the beam displacement to the next groove, and then the second grooving is processed. Until the whole grooving process is finished, press the “release button” of the follow-up material’s pressing on the mobile operating station and loosen the follow-up press device. The PLC performs the next groove positioning instruction. The beam immediately moves back to the next groove and repeats until all grooves are finished. After the completion of the grooving work, loosen all the pressing devices, back the beam to the appropriate position, take out the plate materials, and clean the working table. When spray cooling is needed, the switch in the electric cabinet will be opened first, and the cooling system will be automatically lubricated during the cutting process. After the operation, conduct the daily maintenance of the grooving machine, cut off the power supply and clean the workplace. When you decide to purchase one V grooving machine, you will definitely face such confusion – which one should I choose between the gantry (horizontal) V grooving machine and the vertical V grooving machine. Here let’s tell you the difference between gantry V groover and vertical V groover. Generally the gantry V grooving machine has high working efficiency, however, the accuracy of grooving (slotting) is not as good as vertical V grooving machine. 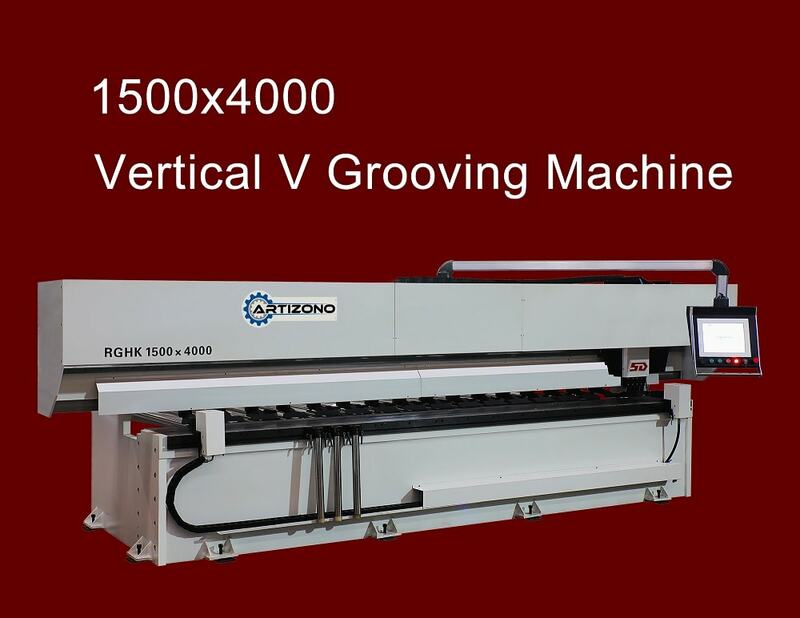 Besides that, if the sheet metal is in non-specific shape (cut by laser cutting), more grooving line will be needed, then we suggest you to choose vertical V grooving machine. If it is a whole piece of sheet metal or more symmetrical piece (square or rectangular), we recommend to choose the gantry type or horizontal type V grooving machine. Further more, the current price of gantry type V grooving machine is a little cheaper than the vertical V grooving machine and the gantry type is still the relatively popular type and selected by most of the customers. We are stainless steel fabrication shop and we need v grooving machine for sheets thickness 3 mm or less and size 4 meters by 1.220 meters. 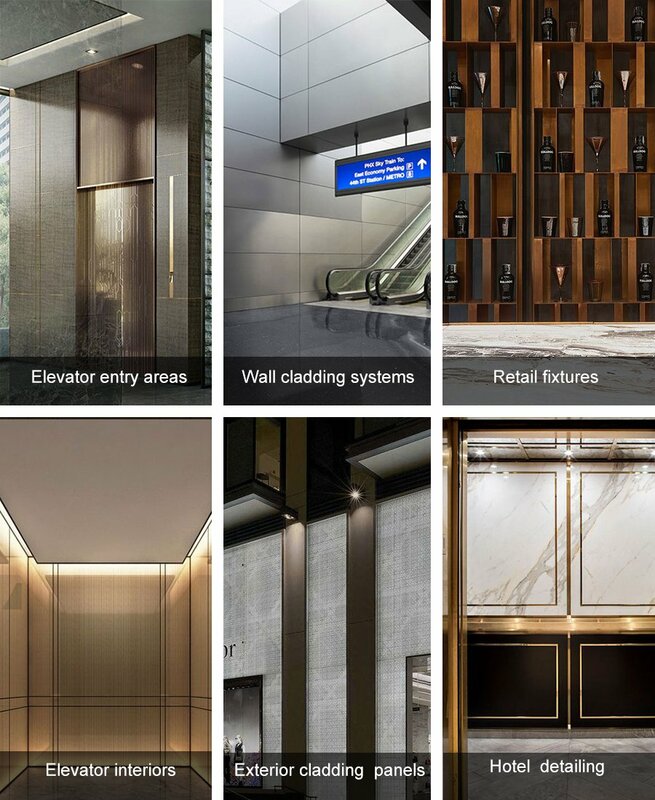 our work is mainly for cladding and decorative items made of sst and brass. Our work items varies in length and shapes. could you specify suitable machine for our purpose – Gantry or Vertical and options . Hi Mr Abdul, as per your practical use, we recommend you the vertical type V grooving machine.